“Known for her imaginative use of animals in storytelling, Belgian-born Nicole Snitselaar has created a charming tale about a scary thought. What if you went out with your mother one day and got lost? In this case, an exuberant little fox, playing in the snow, loses sight of his mother…. Youth Services Book Review recommends putting Little Fox, Lost at the top of your to-read pile! What did you like about the book? Originally written in French, this book was first published in Canada with the support of the Canadian council for the arts. It is a story of a little fox who has gone for a walk with his mother in the forest. When mother fox meets another fox and stops to chat, little fox sets off to explore on his own. He soon finds himself lost in the forest with nothing but lots of his footprints in the snow around him. When an old owl offers to show him the way home, he remembers his mother’s song about what to do if he ever gets lost. The happy ending reinforces the important message. To Whom Would You Recommend this book? Told in a non-frightening way, this story addresses the situation of what to do if a child becomes separated from his mother. It’s a good story for parents to read to preschool children and for teachers to read in school to kindergarten classes. Without making children anxious about the situation, it teaches them a strategy. “Moving to the US wasn’t as big of a culture shock as we expected. Well, at least not until the results of the presidential election came in… We live in the liberal Pacific Northwest, so life is not so different from rainy Germany. After Finja was born I realized that education and upbringing in the US definitely is different from childhood in Germany though. One example: Stranger danger. Even with a policeman as a dad, my sister and I never were explicitly warned about strangers. Not because we were distrustful by nature, but it seems as if our parents were just not afraid of some outsider would come and swipe us away. I thought this was a generation conflict – after all I pedaled my bike through the dark woods when I was middle school aged. You can’t compare the 80s and 90s with today, can you? But speaking with my parent friends in Germany made me realize that it’s only not a question of generations – it’s a question of culture as well. So with a naturally friendly and outgoing daughter I thought it was time to tell her about not wandering away (she loves to do that!) and not trusting anyone she doesn’t know – and even be careful of people she knows. But how can you do it without inflicting distrust and fear of other human beings? I didn’t search for Nicole Snitselaar’s ‘Little Fox, Lost’, but it was the perfect solution to our problem…. “This is certainly a week for Pajama Press on CanLit for LittleCanadians with Little Fox, Lost being the third book from this publisher that I’ve reviewed in the past 4 days. That says a lot about Pajama Press’s releases. Except for review copies, which I get from many publishers, I receive no renumeration for any reviews. I just review those books that I believe need to be read and Little Fox, Lost is such a book. 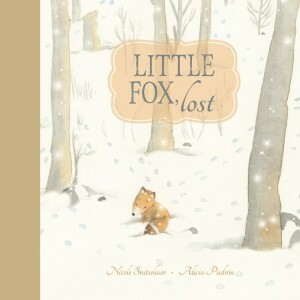 Written by French author Nicole Snitselaar and illustrated by Venezuelan Alicia Padrón, and translated by Pajama Press’s own Erin Woods, Little Fox, Lost is a beautiful, soft book in textual sentiment and physical texture (it has that wonderful cushioned cover) with illustrations evocative of the majesty and solitude of a forest in winter…. …Originally published in French, this nonthreatening story acts as an important conversation starter for children about strangers and getting lost. Snitselaar’s text explores negative emotions like fear, anxiety and uncertainty that children may associate with being separated from a caregiver….Most significantly, children are reminded that they should not automatically trust strangers, but that seeking help can be a positive thing. The story also champions ingenuity, emphasizing that it is important to be creative when faced with a problem. In support of the gentle tone of the text, Padrón’s soft, pastel illustrations convey a sense of warmth and safety despite Little Fox’s predicament. As a result, young readers will not become afraid, but instead, will come away from the story feeling reassured and empowered. Little Fox, Lost is an effective and compassionate way to begin a discussion about strangers with young children, making it a recommended addition to classroom and library collections. Little Fox, Lost receives its first review from Kirkus Reviews!